French toast normally takes a lot of time to make. Stand at the stove. Dip. Cook. Flip. Repeat. 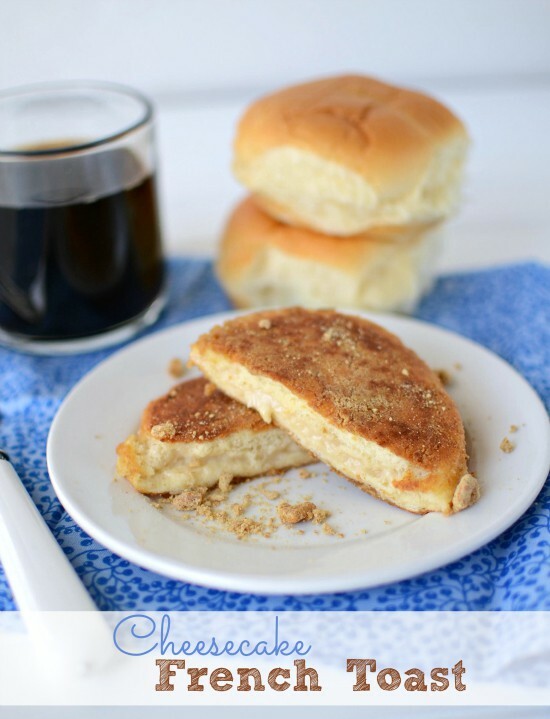 When you make an Overnight Apple Pie French Toast Casserole it’s way easier. Dump. Bake. Eat! The other day Mel told me the voice on his phone was now a man. He hadn’t done anything to the phone; she just all of a sudden changed to a he. There are so many things wrong with this situation I cannot even start. Now, in Jordan’s defense, I probably don’t say the nicest things about my Siri. I’ve called her a witch on many occasions. I’ll be driving and ask where the Roller King is and she’ll tell me where Rolling Hills is. Not helpful. I’ll be driving and ask here where the nearest gas station is and she’ll tell me I’m out of luck. I start to sweat and 30 seconds later drive by a Chevron. Seriously? But, in her defense, if you ask her a Knock Knock joke or “What does the fox say” she’s pretty darn hilarious. Funny, I just asked her what French Toast was and she took me to wikipedia. Does she know nothing about me? Crazy for Crust, Siri. Google it. I thought I was being all original when I created this overnight french toast recipe. I mean, overnight bluberry french toast went around the blogosphere last month. And I’ve made a banana version. But apple pie? Surely I’m a genius. I’ve been dreaming about this recipe for awhile now. Craving it, actually. Because I knew that I was going to make a french toast base and top it with apples and then put crumble on top. 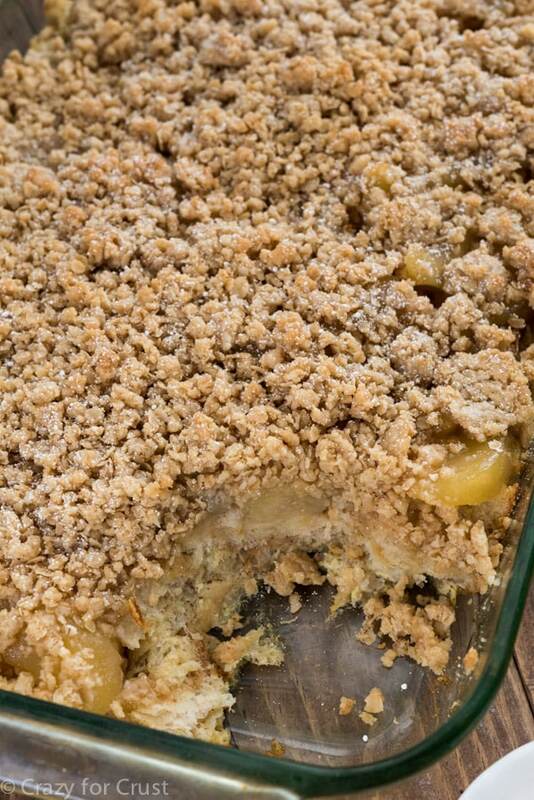 Because everything should be topped with crumble. 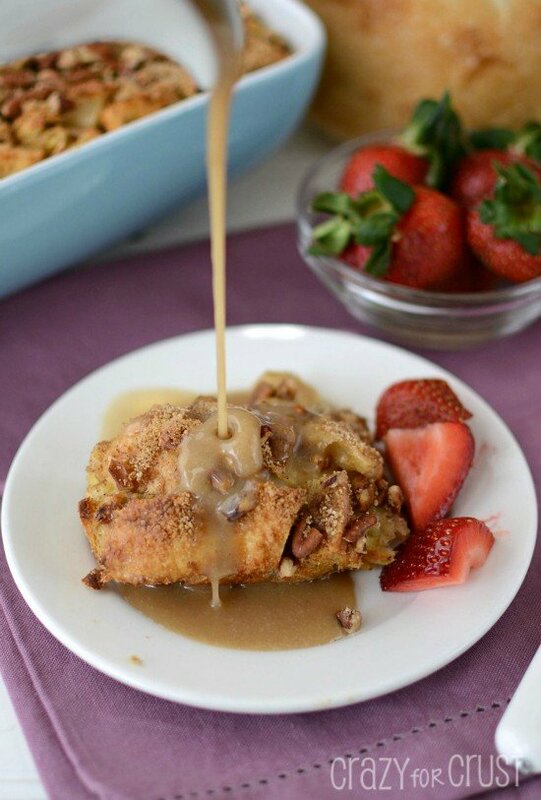 This Apple Pie French Toast Casserole is so good. It’s like dessert that you can eat for breakfast. The french toast part is like the crust, topped with apples and crumble…just like pie. I used a stale-ish loaf of sliced french bread. I always buy those already-sliced boules and then eat one slice and it goes stale. So I sliced the rest of the 1lb loaf up for the base of the french toast. You pour the egg mixture over the bread and then let it sit overnight. I literally did the bread and egg mixture in 5 minutes before I went to bed. You can do it earlier in the day…I just forgot until 8pm. I used an apple pie filling for my apples. It was easier and I had pie filling on hand. You can also cook the apples like you would for this recipe and use them instead. The crumble is my favorite crumble topping. Brown sugar, butter, oats, and flour. Just four ingredients get mixed in a mixer until they are crumbly. Top the french toast and bake and you have pie. 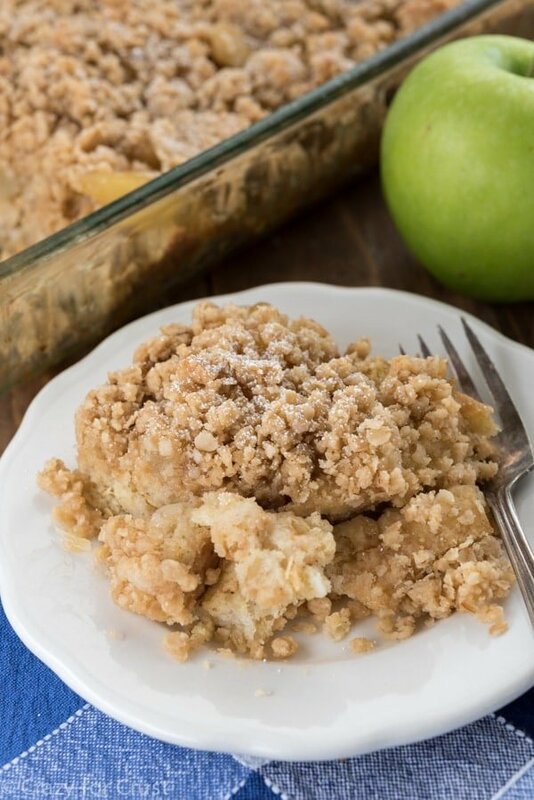 This Overnight Apple Pie French Toast Casserole is just like an apple pie...for breakfast! Spray a 9x13 baking dish with cooking spray. Slice french bread into bite-sized cubes. Place in the bottom of the pan. Whisk eggs, milk, vanilla, granulated sugar, and cinnamon until blended. Pour over bread pieces in pan. Cover with plastic wrap and refrigerate for at least 6 hours or overnight. Remove french toast from the refrigerator. Evenly spread pie filling over the top. With a hand or a stand mixer, combine butter, flour, brown sugar, and oats until a crumble forms. It’ll take awhile, especially with a hand mixer. Sprinkle evenly over the top of the casserole. Bake for 33-38 minutes until slightly golden and baked through. Serve warm with powdered sugar, syrup and/or whipped cream. This looks like HEAVEN ON EARTH! I mean, seriously? Amazing! Yep, never google your recipe ideas! It is such a let down when you realize you are not the creative genius of an original recipe idea like you thought. Do. It. All. The. Time. 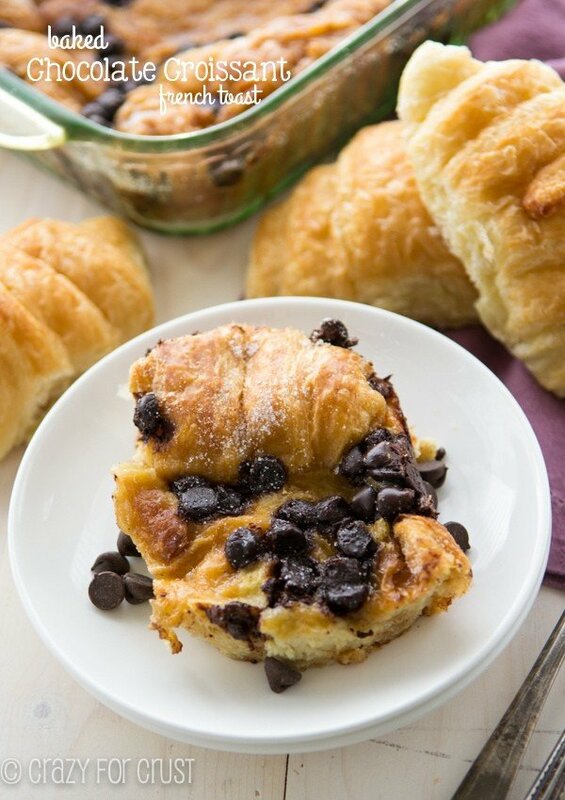 Either way, this french toast casserole looks AWESOME! Apple pie is my favorite desserts. This french toast would disappear at our house! LOVEE. love love overnight recipes! And I’m always up for desserts for breakfast! this looks so good, drooling! Pinned! Sooo, umm, Siri intimidates me. When I accidentally double tap the home button and she comes on, my blood pressure rises. Just spotted: the next French toast casserole I need to make. This is fantastic, Dorothy! That’s a beautiful pour shot. Apple pie and french toast is a winner to me! I made this for brunch on Sunday and it was a total hit! I thought I was going to have some to bring home for myself through the week, boy was I wrong! The whole 9×13 was gone! I definitely will be making this again (and again!) :). Did I miss something? How is this an “overnight” recipe??? Because you leave it overnight to soak and bake it in the morning! Do you think this could be made with gluten free bread as well?